Deb's Cup of Tea: The things I see while working. So, last Wednesday, I have to do this inspection of a trucking company. We're walking around the building where truckers check in to drop loads or pick up loads. 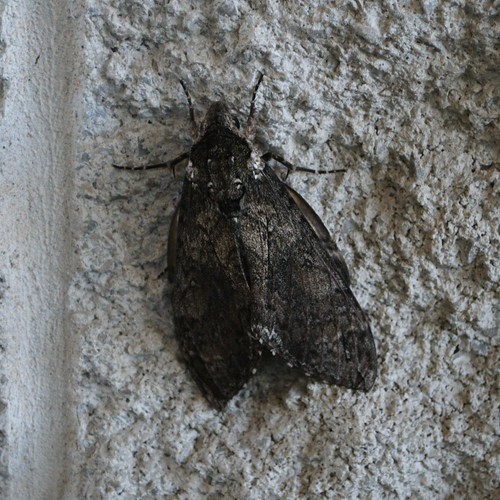 On the south side of the building, we saw this moth. With the camera I was using, I could get a good close up. This really doesn't tell you the size of it. It was at least 3 inches long. I know you don't believe me so here is a side view of it. Those are standard 8 inch tall concrete blocks on which it's resting. This should give you some sense of the size of this. The guy from the company who was walking around with me said, "Ewwww. Gross!" and one of his co-workers was going to smash it. I thought it was beautiful but I didn't have time to pick it up and move it. I spent a couple hours pouring over moth photos online but I have no idea what kind this is. Unlike the milkweed caterpillars of August 14th, I have no frame of reference for beginning a search. 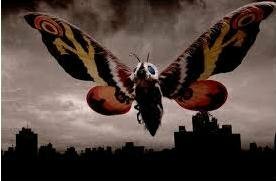 "Big moths" didn't really yield anything helpful. Finding this on the side of a building and not against, say a tree, doesn't help me in narrowing down a search for kind. I like these kinds of serendipitous finds when I'm out and about. There is so much of life that goes unseen because we are focused on the task. I wish I could have brought this bug home so I could see what, if anything, it turned into. The other thing I thought of was, I don't want something this large in the house. Mija loves to chase the millers and moths that fly in at night. It's bad enough when 10 pounds of cat land in my lap as she's chasing something three quarters of an inch long. What if she were chasing this? ER Nurse: So how did you get all these scratches? send your picture and pertinant info to www.extension.iastate.edu/linn/yardgarden. that's the extension office in marion. wonderful people. Oh man! Talk about a gross error. Yup, that's as big as the moth.